Gerald Ambrose 1936 Corona Standard Serial # 1C43140 1936 Corona Standard typewriter, Serial # 1C43140 Gerald Ambrose's 1936 Corona Standard typewriter. 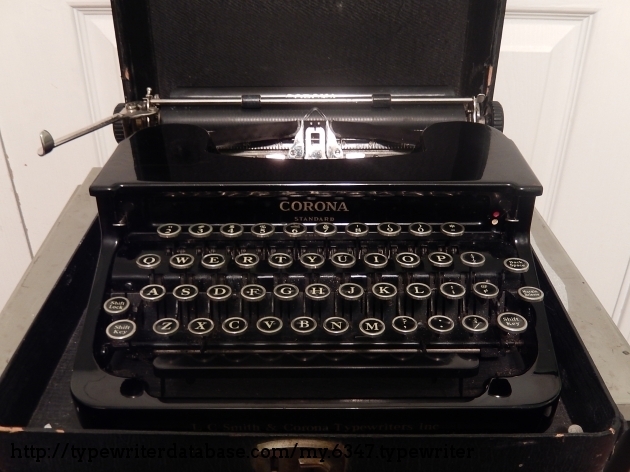 2016-07-15 2017-12-02 From the Virtual Typewriter Collection of Gerald Ambrose: 1936 Corona Standard Serial # 1C43140 I bought this machine from an antique store back in June along with a 1957 Remington Quiet-Riter. 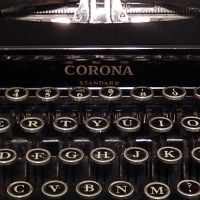 The Corona is a very nice machine to use. It is quieter than many of my other machines and is quite comfortable to use. The platen is on the hard side, but the type is still crisp and clean. Update 8/14/2016: I have come to notice that my Corona Standard is different from other Corona Standard's of the same year, in that it has a paper bail instead of paper fingers. If anyone could help me figure out why this is I would really appreciate it. Left the collection on 12/2/2017. I bought this machine from an antique store back in June along with a 1957 Remington Quiet-Riter.